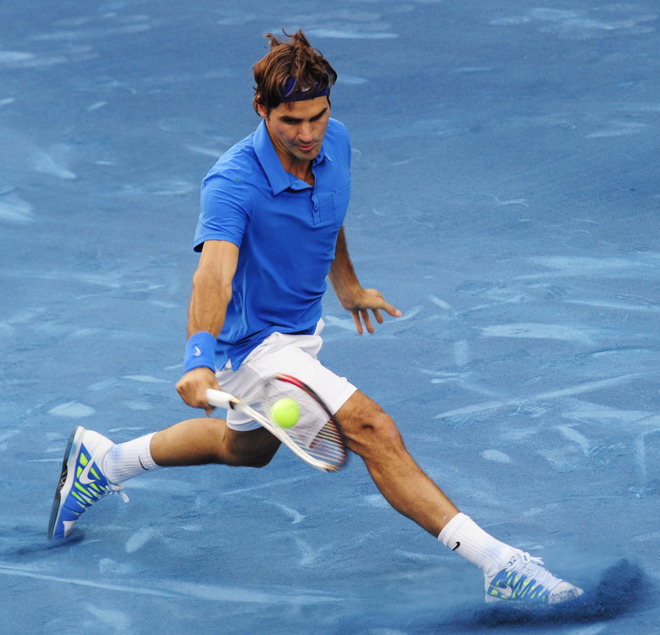 Fed has won Madrid indoors, on red clay, and on blue clay. What a week of tennis for the Swiss legend, Roger Federer. Coming off an extended break after Miami, the Maestro captured his 4th title and 20th Masters crown, as well as regaining the #2 ranking from Rafael Nadal. He was forced to bring his very best to the court against Tomas Berdych, whom Roger defeated 36 75 75 in an epic comeback where the Fedmeister was pushed to his limits both mentally and physically. In the first set, Berdych came out on fire. He quickly latched on to a 3-0 lead and held from there, winning it 6-3. Fed did not really play badly (apart from one error in judgment at 1-0 30-30 which lead to dropping his serve) but Berdych was killing the ball and hitting winners all throughout the court. It was a classic example of a big man stretching the limits of his powers and not giving his opponent any say in the matter. Oddly enough, I was still very confident about Roger's chances to win the title. Surely the Berd could not keep up that astonishing level of play another set? I was right, at least at the beginning. Roger played better and got an early break to go up 3-0. At 5-3, he was broken, and it looked like a tiebreak would be coming, a scary thought for Federer fans. Thankfully, Roger had other plans and broke the Czech's serve to take the 2nd set 7-5. The shoes. The racket. The fist. The roar. The hair. Gotta love it. The third set was incredible. Federer went down 0-30 in each of his first three service games but somehow escaped them. Then at 4-3, Roger got a break, and he would be serving for the match. The Master could not close it out, however, and was broken. 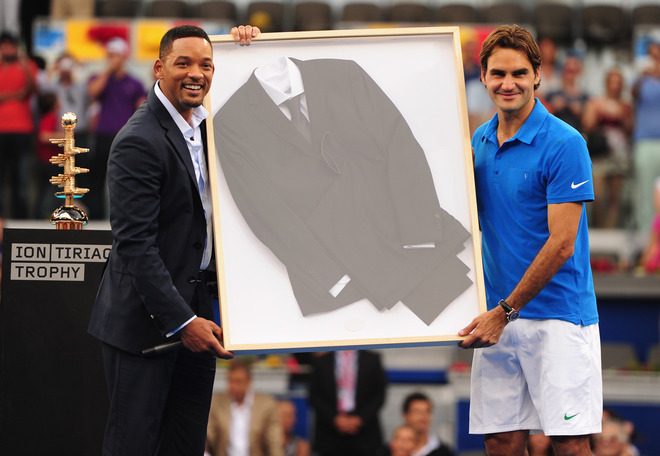 Both men held serve until 6-5 Roger when Fed avoided a second tiebreak by breaking in the final game to win the match. Stellar. For Roger, there were two reasons why he won the match amidst constant pressure the entire match: his serve and his mental toughness. Both of these assets have been incredible in 2012 thus far but both really shined in this final. Numerous times in the final two sets, Roger came up with an ace or an unreturnable to avoid trouble. In nearly every game on his serve, Berdych tested him, getting to 30 or deuce on many occasions. A Roger Federer of 2011 may have buckled under that kind of pressure. Not the RF of 2012. That kind of win for Roger really showcased his improved mental abilities. In the 2nd and 3rd sets when he relinquished break leads, he did not get down on himself and just kept his foot on the gas. Both times, he avoided going to a tiebreak. He was clutch when he needed to be and considering how well Berdych was playing, it was a monumental victory. Federer has temporarily gained the #2 ranking with his win in Madrid. Whether or not he retains it heading into the French Open depends on the proceedings in Rome. It is questionable whether or not Roger will play. If he doesn't, he will lose the #2 ranking. If he does play and makes the semis while Rafa does not win the tournament, he retains it. But should Rafa win, it does not matter what Roger does, he will fall back to #3. I have no doubt that Roger wasn't feeling 100%, but he still played amazingly well and he usually doesn't if he is feeling any ill effects on the body. His decision on Rome will be made on Tuesday likely, and it will likely be based on his goals. If he wants to get more preparation before the French Open, he will probably play. If he does not care about holding the #2, he will not play. His health is also an issue to take into consideration, but nobody really knows his physical condition but him. Overall, it was a marvelous week of tennis and we should all feel blessed that we get to witness Roger play such stunning tennis at his age and at this point in his career. He continues to defy the odds and has once again but himself in a position to be a real threat in the upcoming majors - just the way it should be, if you ask me. Fun times for the Federer family! I'd also like to speak a little about Roger's mother, Lynette, and his wife, Mirka, since the win took place on Mother's Day. If it wasn't for Fed's mom, he probably wouldn't be the person he is today, and I believe a lot of his charming personality comes from his upbringing. And Mirka, Fed's longtime companion. It is often overlooked how important she is to Roger's success. As an athlete in any sport, your personal life is important, especially in tennis where they travel all over the world. Roger's stable life off the tennis courts has contributed to his great success on them, and Mirka deserves credit for being there all these years in Roger's box, supporting him unconditionally. great match! roger used the wrong tatics for some in the match. but he played with heart and used his talent to finally prevail.